The generator works with a template engine based on Apache Velocity. A template is a file containing the fixed part of the file to be generated. The generator merges the template with the model's entities in order to produce the generated file. 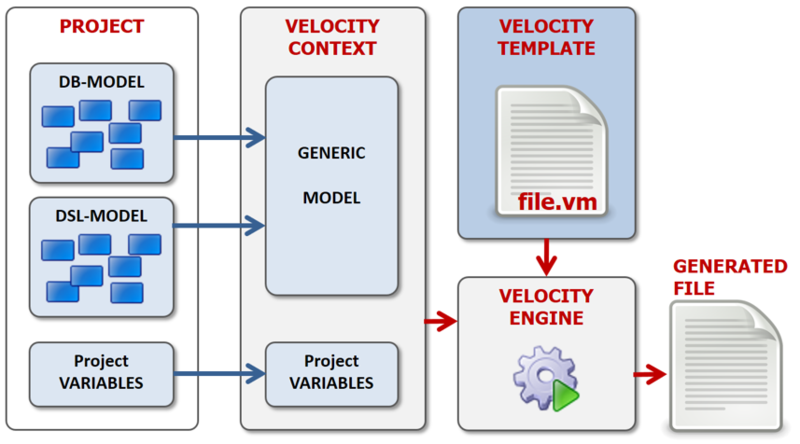 The "Velocity context" contains all the objects usable in a template. All the entities defined in the model and all the project variables are loaded in the context. In the context the entities are exposed in the same way regardless of their original model (DSL model or DB model). Hence the templates are not model-dependent. In the template file the context objects are accessible using their symbolic name preceded by the character "$". Telosys templates are organized in "bundles". Each bundle contains a set of templates files (".vm" files), a "templates.cfg" file and a "readme.md" file. A bundle contains a set of templates designed to generate a part of the application (web interface, domain classes, services, persistence, etc). 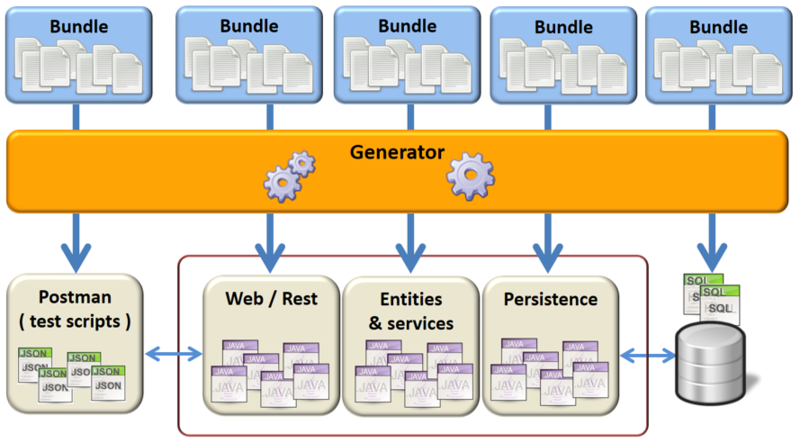 In general several bundles are needed to generate a complete application. So there may be dependencies between the bundles. The templates bundles are published on GitHub (a bundle is a "Git repository"). The official Telosys bundles are published here : https://github.com/telosys-templates-v3 . Downloading and installing bundles is done by Telosys. After being installed a bundle is a directory located in "TelosysTools/templates" (the name of the directory is the name of the bundle). So everyone can create their own bundles and publish them on a GitHub organization. Telosys can install bundles from any GitHub organization. The templating language used by Telosys is "VTL" : Velocity Template Language. Enjoy code generation for any language or framework !